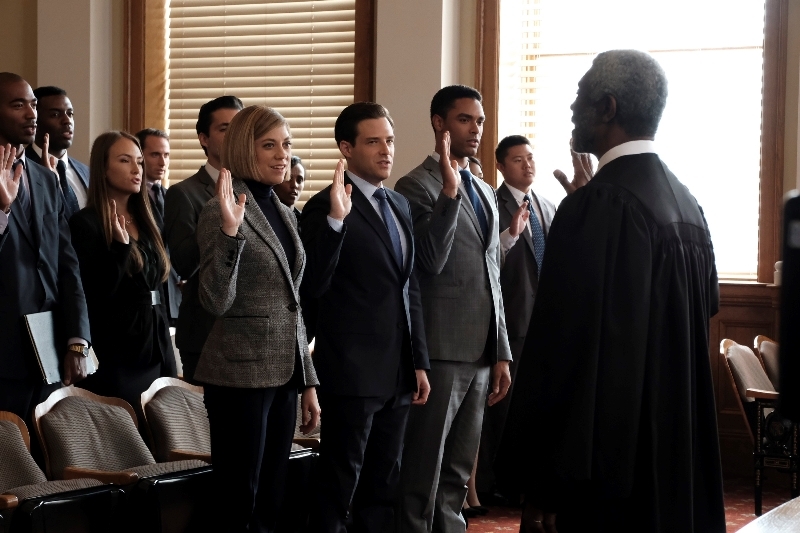 For The People Review - Scandal Scribe Switches Gears For Young, Beautiful Lawyers - Are You Screening? The ABC page that gives About information on For the People includes – “The series from ABC Studios is created by Shondaland’s Paul William Davies, who executive produces alongside Shonda Rhimes, Betsy Beers and Tom Verica,” and it’s a curious construction that probably gives everyone all they need to know. Davies’ entire list of credits consists of two episodes of Betrayal, writing about five episodes of Scandal, and serving as executive story editor for Scandal on several episodes. Thus, apparently, he is Shondaland’s. It’s an odd label to stick on someone, even if they want it, but it’s really just an excuse to work Shondaland into the conversation. The show’s promos may reference that it is “Brought to you by,” or, “From the producers of,” or, “written by,” so that it can name shows like Grey’s Anatomy (which is too hip to call by its full name, so it probably just says “Grey’s”) and Scandal, but it really wishes it could just say Shondaland at you. It’s all an effort to critic-proof the show by continuing the tradition of pretending Shonda Rhimes is the creator of every show you love. She’s a brand, and we love the brand. Really, she has about 20 shows, right? Actually, she’s written Crossroads, The Princess Diaries 2: Royal Engagement, Grey’s Anatomy, Private Practice, and Scandal, and very few episodes of those shows. She has additionally produced Gilded Lilys, Off the Map, The Catch, Still Star-Crossed, and How to Get Away with Murder. I waste my time laying this out, above-and-beyond the extent to which reviewing Shondaland entries is inherently a waste of time, simply to point out that the only things that have worked for her are Grey’s, a Grey’s spin-off, and two shows that might as well have the tagline – “This is even dumber than Grey’s.” The empire is really, now, just three shows that have daytime soaps looking at them sideways, created for people who want to watch daytime soaps, but don’t want to tell people they watch daytime soaps. Now, the real monkey wrench in this whole mess is that Grey’s Anatomy was actually a pretty decent show… for about a season. Sure, guilty pleasure-ish, lighter fare, but it was interesting and actually wanted to show off characters. It bears no resemblance whatsoever to anything after season three, or anything else Shondaland, and the simplest way to point out the difference is just to say that the series didn’t start off calling you stupid. Enter For the People. Like I said, a critique of the show is mostly meaningless. The most anyone wants to know is if it fits the Shondaland they love, or perhaps if it diverges enough that haters might give it a try. So, is it another The Catch, or Grey’s 5.0, or something else entirely? While I might mention how contrived and simplistic the effort is here, built around characters that remind of Anthony Michael Hall’s end-of-detention essay, it wouldn’t ultimately serve any purpose any more than noting the myriad ways in which this show proves that none of these people ever went to law school. Questioning the pretty, legal people show for things like having prosecutors who believe they are supposed to get a conviction even if they are all but positive the person is innocent (or not knowing 100 things per episode that anyone who went to law school would know), is like questioning the plausibility of car explosions. Painting in laughable stereotypes is simply de rigueur. No, this is a rather serious sort of guilty pleasure attempt, but it is one that is far more reminiscent of Grey’s Anatomy‘s first episodes. Regé-Jean Page, for example, plays hopeful prosecutor Leonard Knox, and he’s fully defined by his arrogance, because audiences want someone to hate. Susannah Flood plays another prosecutor, Kate Littlejohn, who will slam home the idea that she is Paris Geller upwards of a dozen times in the show’s first ten minutes, because that makes things easy for you. Allison Adams (Jasmin Savoy Brown) and Seth Oliver (Ben Rappaport) are living together and have been dating for quite some time, but are on opposite sides of the prosecutor/defender fence. As we enter the show they will really start to clash over this fact, just like any two regular people who are living together despite never once having a conversation remotely related to their work or ideals. The extent to which two lawyers can date for an extended period and never talk about the law is legend. These are the waters in which we swim, but it sounds a lot worse than it is, which makes predicting the show’s success, and/or your enjoyment of it, particularly tricky. Britt Robertson leads the cast as Sandra Bell, in much the way Grey’s Anatomy is about a lot of people, but is really about her, and she has the same syrupy charisma Ellen Pompeo managed in kicking off that series. Her zeal is harder to sell than the show thinks, and is offputting anyway, but when she’s around the show has a charm that is hard to ignore. And, if Flood gets a chance to morph into an actual person through a few episodes, she could become the hit of the show, because she is great, even if her character isn’t yet. Finding the “but,” is as tricky as going down the rabbit hole of wondering who out there might bother with a review in the first place. 99% of people are sold, or can’t be sold, simply by saying Shondaland.